I am trying to install my ecobee 3 light but the previous thermostat did not use any c wire. Fortunately, there was an unused wire in the wall and I would like to set it up as a c-wire. The problem is that I have no idea where to connect it to our boiler. 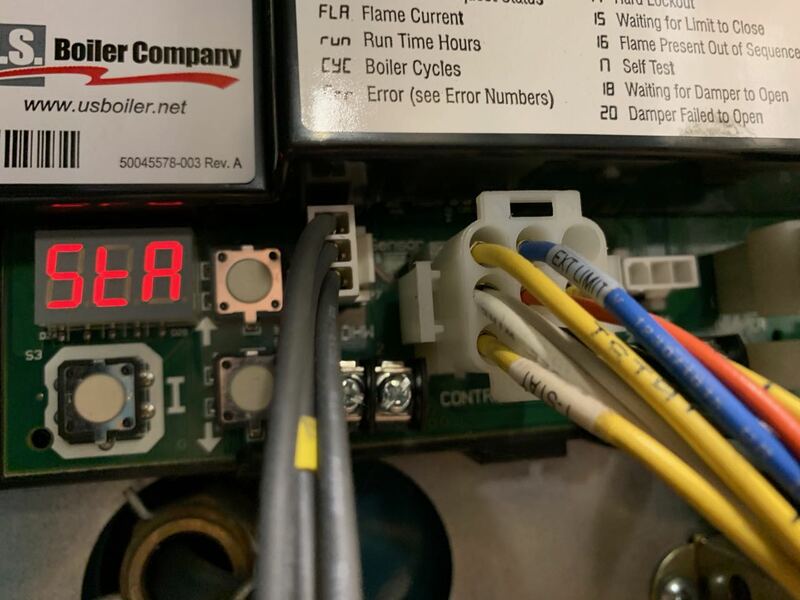 We have a Burnham Series 2 boiler, which uses Intelligent Hydronic Control (Honeywell S9361A2072) and a Transformer (40 VA, Honeywell AT140D1297). Is it possible to connect a c-wire to the boiler? I did try to find information in the technical user manual, which includes the diagram below, but couldn't find anything that describes the different ports/slots. It does say that "For zone valve wiring, a separate 24V transformer is required rather than attempting to use the boiler mounted control". But I think that is unrelated. Edit: Added image of P5-8. 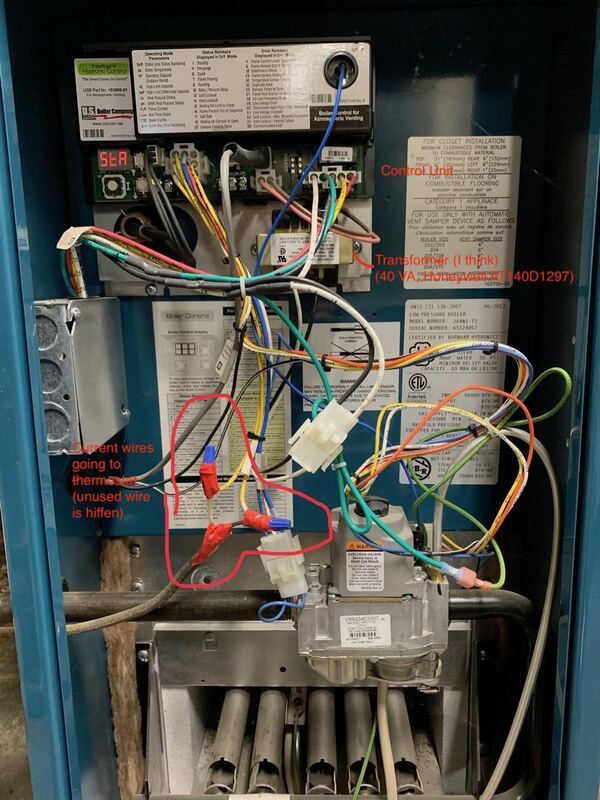 If you look closely at the wiring diagram for your boiler -- there is a 9 pin connector with a harness connected to it that connects to the thermostat wiring junction, the gas valve, and the limit circuit. The white wire in this harness, while technically the gas valve common or MV/PV terminal, is a 24VAC common (C) wire, and can be tapped to serve other needs in the system. In fact, in the wiring diagram, it is shown running to the limit circuit extension plug as well for use by low-water cutoff or equivalent safety devices. So, with power to the boiler off, we can cut the white wire bundled with the two blue wires in the harness to that extension connector and splice both of the cut ends together with a wirenut, giving us a bundle we can splice our thermostat C wire into. Install your Ecobee, turn the boiler back on, and enjoy! 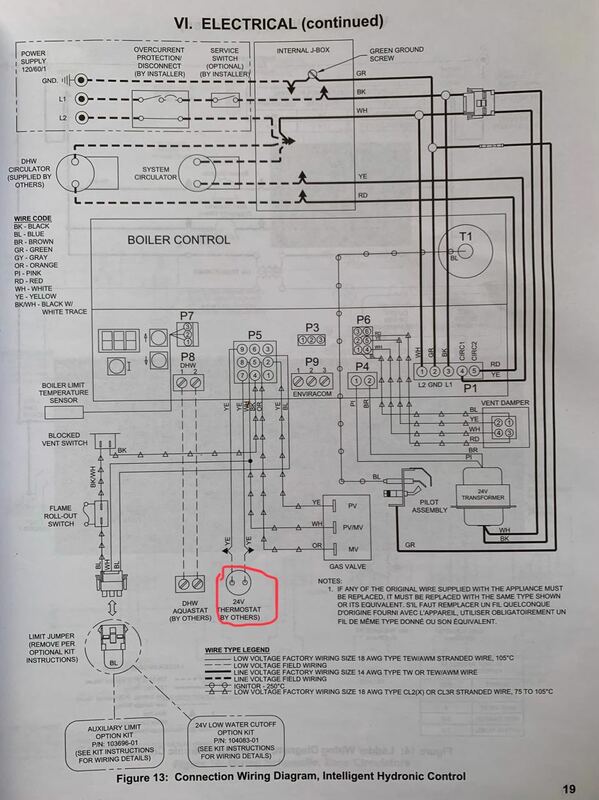 As an aside, the reference in the control manual to not putting "auxiliary controls or limits" in the grounded leg means that no limit switches or control switches can be installed in a way that breaks the 24VAC return path from the control board to the transformer -- it is not a concern here. Not the answer you're looking for? Browse other questions tagged hvac thermostat thermostat-c-wire boiler or ask your own question.